Gluten Free Potstickers | Low Carb, Keto-Friendly! With this recipe, it feels like we've achieved the impossible. Never did I think we could create low carb, Gluten Free Potstickers! If you didn't actually see us make them, frying them up and tasting them on camera, you might not believe it either. I was inspired by the combination of scrolling through Instagram food videos and someone asking us to create keto dumplings or potstickers. Well, we did it and you can watch me make them below, and then make them at home for your friends and family! The Best Low Carb, Homemade Potstickers Recipe! All we wanted to do was provide you the base for low-carb potstickers, so you could bring back your favorite take-out, homemade style! What makes these the best, aside from the great nutrition, is how easy they are to make. You can make them cute if you're hosting family and friends or just ball up the filling like I did in the video, which makes them one of the easiest potsticker recipes to make. These are the best because they are basically ZERO CARB. Yes, I said zero carbs. The dough is made from cheese and egg yolk so you're getting a nice dose of fat and protein, without all the carbs in a standard potsticker wrapper. As long as you know how to use a microwave and fry up food on the stove top, you can make these! Aside from the potsticker wrapper recipe, you can fill them with whatever you want, which means you dictate the carbs in each one. Go light on the seasoning for a friendlier version or get a little wild and make some low carb peanut sauce to go along with them! The choice is all yours. One of my favorite foods growing up was any sort of Asian food, from Indian to Chinese. We always got take-out and ate in front of the television as a family. What family didn't do that? 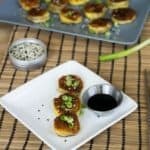 Due to my obsession with Asian food and re-living my childhood, we have several Asian recipes and they are incredible! We highly recommend you try our keto butter chicken, and easy cashew chicken even before making these delicious, gluten free potstickers! Note: We tried steaming these for dumplings and it absolutely is possible, however you should note that the cheese will melt slightly from the steam so you want them to cool and harden a bit prior to picking up and eating! Recipe can be quickly added to MyFitnessPal - Search "KetoConnect - Gluten Free Potstickers"
Microwave cheese in a medium bowl for 30-45 second until melted. Add yolks and combine using a spatula. Microwave for an additional 10 seconds and combine fully. Pour the cheese yolk mixture onto a greased parchment paper and cover with another piece of greased parchment paper. Roll out the mixture pretty thing with a rolling pin. Cut out 12 circles and fill the center of each with your favorite filling (we used cooked ground pork as seen above in the recipe). Fold up the sides to meet in the center at the top and squeeze closed (watch video to see how I did it). Place all the complete potstickers on a parchment lined plate and refrigerate for 3-4 hours to allow them to set and harden. Heat a pan to medium-high heat and add in 2 tbsp of oil of choice (we used avocado oil). Add the cold potstickers to the heated pan in two batches and allow to crisp on one side before flipping. Once browned on both sides remove and set aside. Optional: garnish with sesame oil and sesame seeds. Note: You may have to re-microwave the mixture unused when cutting out the potstickers and re-roll it out to make more! The nutrition information listed below is per serving. This recipe makes 12 servings. 1 potsticker per serving.